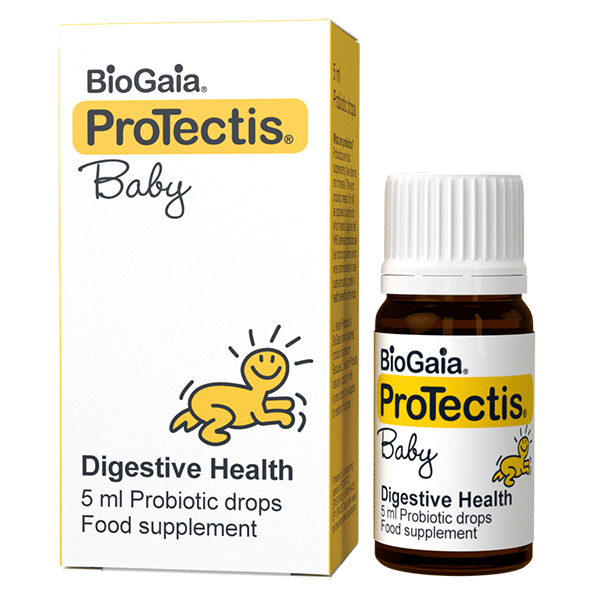 BioGaia Protectis baby drops is a probiotic food supplement containing the patented lactic acid bacterium Lactobacillus reuteri Protectis (L. reuteri DSM 17938) that helps the good microorganisms restore a natural balance in the gut. To dispense the drops tilt the bottle and give by spoon. Use 5 drops once daily. Do not add to hot drink or food as this may damage the live bacteria. Storage: Store in a dry place, not above room temperature (max 25 °C / 77 °F). Keep out of reach of children. Keep the bottle closed. Avoid contact with fluids like saliva and water. Opened bottle should be used within 3 months. Sunflower oil, medium chain triglyceride oil (palm kernel) and L. reuteri DSM 17938. The package includes a white desiccant device for prolongation of shelf-life. The desiccant device is approved for use in direct contact with food and should not be consumed. The product is packed in a protective atmosphere.